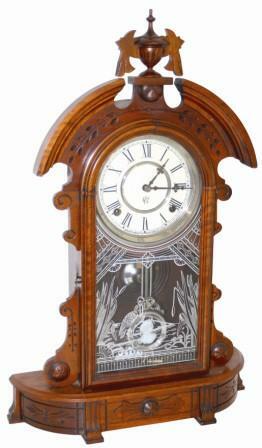 Waterbury Clock Company walnut parlor clock, "Hecla", ca 1881. At first glance you think the case is missing some finials, it isn't. It is correct. The very top ornament has a couple of tiny wood flakes; otherwise the case is near perfect. It has a great original glass, dial, hands, cameo pendulum, beat scale, signed Waterbury key, nickel bell, and about half of the old label on the back. Movement is 8 day, running and striking properly. LyWaterbury No. 1541.